This tutorial will guide you step by step on how to integrate Jquery into SharePoint, and the best part is being an end-user with no special administrative privilege you should be able to do the integration of Jquery into SharePoint... Guess that should have given you some happiness !! Now let me take you through the steps, you don’t need to edit any SharePoint Master Pages or get the SharePoint Designer / Visual Studio all you need to do is just a "Content Editor Webpart" and a document library to store the "Jquery" Files. Do you want to see the pop-up working on your site straight away ? If So lets do it, so that you can see how it looks in your SharePoint site , follow the below 2 simple step for you to get a feel of it. Unzip the zip file you got now, copy the folder "jquery-bubble-popup-v3" into a SharePoint Document Library. Open the Folder > Click on the html page you see here , "ClickMe.html" and that's it, it should open up the file where you can hover your mouse on the "mouse over here" text and you should see a pop-up.. There is a small tidying up need to be done and put proper reference for this, You Ready ? 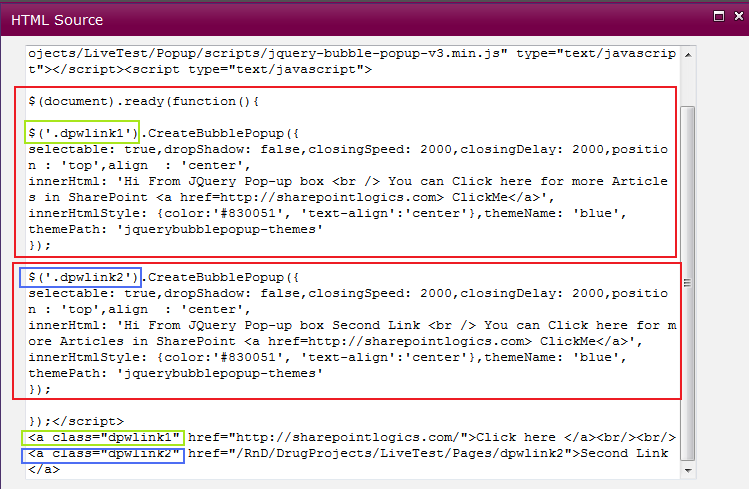 Copy the whole script code from "SharePoint Jquery Script.txt" updated with your reference and paste it in the CEWP. Paste the Script in the HTML box > Click OK > Save the Page. Now when ever you paste any scripts in the CEWP, Sharepoint always does some editing to clean it up, so ensure you got the scripts without any spaces or changes else it wont work, double check it with the screen shot below. You can create or associate this pop-up with any links or images on the page all you need to do is to copy paste the same code segment and create unique id and reference the Class id. 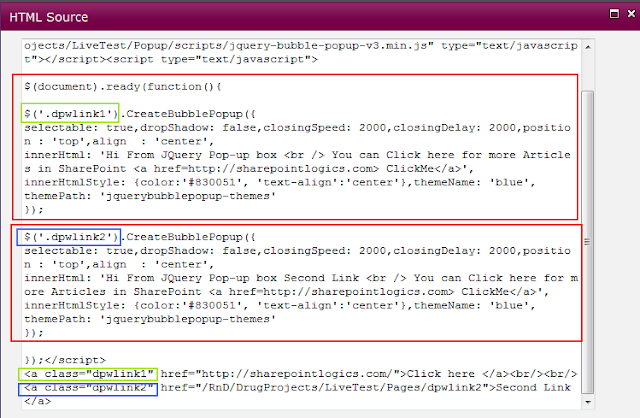 That's it; so you have implemented Jquery in SharePoint, you could experiment with more features of Jquery. The click me page does not have any hover effect...I am using SP2010...Please help! If you have followed all the steps it should definitely get it...What is the browser you are using? Same here, does not work wit hthe hover. Also, trying to run the ClickMe.html from a document libray does not work, you only get the option to save the file, not open it. Could this be the same issue when it tries to interact with the script files? Hi There, mine works fine following the scripts. However, it is not pulling the blue border from the themes folder. 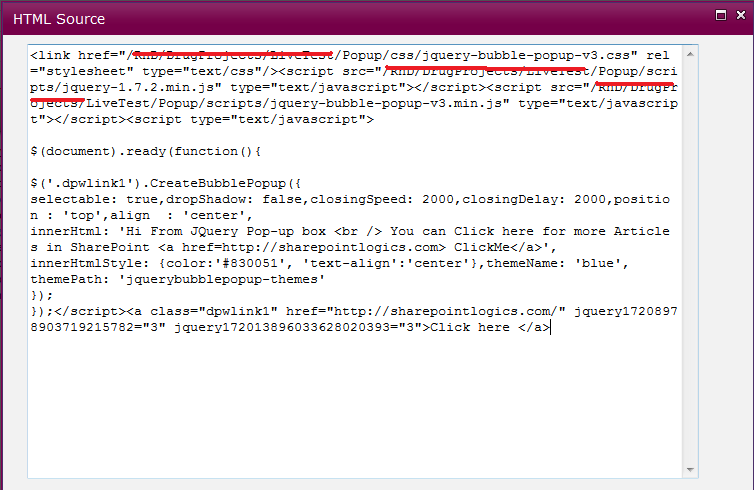 Q: Where in the code refers to the "jquerybubblepopup-themes"? Q: Where do I store the jquerybubblepopup-themes folder in SharePoint? - It refers to the "jquerybubblepopup-themes" folder which resides in "Jquerypopup". It also contains many other themes which you can make use of. - You should ideally store it in the "Style Library" and reference the path.